I bumped to an article that mentioned data on web usage share of iOS and Android devices. I found the numbers a bit odd – the most recent numbers indicate over 60% of mobile web traffic comes from iOS devices, while Android commands ~18% of the web use. Where this doesn’t add up is, the device share of Android has been going up hugely over the least two years, so why hasn’t the web use increased in proportion? How much should it have increased? See how the iOS market share for devices stays flat, while the share of web browsing goes up? 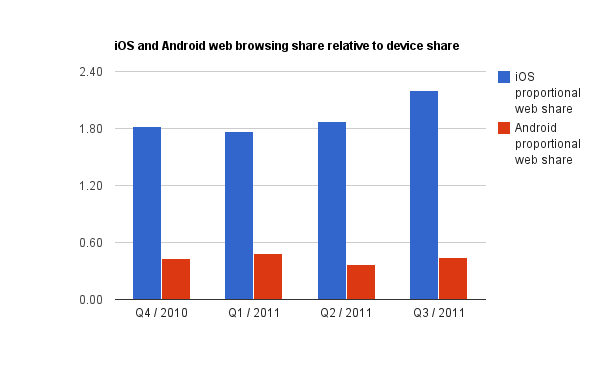 And Android device share goes up, but the web share stays relatively flat? How about visualising the web share proportionate to the device share? Apple web share is now overrepresented 2.2 times, compared to the device share. 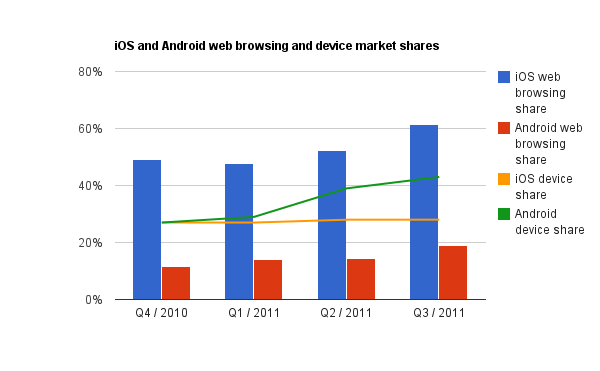 Android’s proportional web share hasn’t effectively changed in a year, and is 0.44 times the share they have on devices. If the data is correct, this indicates that for whatever reason, iOS users are much more likely to actually use their devices to browse the web than Android owners. I’m assuming this is due to a number of factors – the browser in iOS is in my experience more responsive than the Android browser which leads to better user experience, which in turn must be influencing people’s browsing habits. Second, if the premise of Android is affordability, I’m fairly sure the likelihood of iOS users having a good data plan is higher than with Android which in turn will again affect the amount of browsing done using the respective platforms. Additionally, the way Apple has been developing the iOS ecosystem has been more successful at increasing the usage of iOS as a mobile web platform, than how Android has been developing. That’s counter to Google’s premise of monetizing the platform through providing advertising on the mobile web, where the Android should be the platform to offer the best in class web browsing experience. Looking this from the operator angle, people more or less pay the operators based on how much data they consume. If the relative proportion of use vs devices gives any indication of the data bill size for iOS and Android, I can see why iOS users are desirable to the operators. This entry was posted in Uncategorized on November 4, 2011 by Sulka.